On my way back home while listening to the radio station the presenter of the radio program announced, “The next song to be played now is from the film “Qurbani” and the title of the song being "Aap Jaisa Koi" music by Biddu and singer Nazia Hassan. Hearing this lovely number from 1980’s was indeed a nostalgic feeling coupled with journey down the melody lane. One just can’t forget this song and the singer which ignited the disco fever amongst the masses then. So many interesting anecdotes came in my mind hearing the film Qurbani followed by this song "Aap Jaisa Koi” and the popular pop singer Nazia Hassan. My mind started thinking why not pen down short piece and share couple of anecdotes out here. It was the Actor, Producer and Director of Qurbani fame namely Feroz Khan who had approached the Indian composer Biddu settled in London who was popular for the hit songs he had composed during late seventies. Feroz Khan had two conditions set firmly for Biddu. First, the recording of this song would be done in London and not in Mumbai. Second, the playback singer would not be from India. While Feroz Khan was in look out for singer in London who could sing in Hindi. It was here that actor Zeenat Aman suggested the young singer Nazia Hassan to Feroz Khan. For the shooting of the movie Qurbani in London the producer had rented a place in Chelsea for the shooting duration. Zeenat Aman was very close to the Hassan’s family based in Pakistan who had later moved to UK for their daughter Nazia and their son Zoheb higher education. 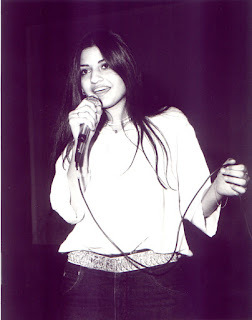 Nazia Hassan began singing from the late 1970s when she appeared on several television shows on PTV as a child artist. She was just eight years of age then. The professional break came to her at the young age of fifteen years when she sang “Aap Jaisa Koi” for the 1980 film Qurbani. The recording of this song took place in a studio at the corner of Oxford Street. The theme of the song “Aap Jaisa Koi” was the introduction scene for Sheela (Zeenat Aman) the gorgeous nightclub dancer in red gown whereas Rajesh (Feroz Khan) is in the club watching Sheela perform. If listened carefully one can distinctly hear the whistle like effect each time after the line “Baat Ban Jaye”. On hearing this lovely number from the young Nazia Hassan her Mother felt either she would make it as super hit or break it as a flop. Father was bit apprehensive as he did not want their kids studies to get affected in any way. What surprises is that music just a hobby for Nazia but her achievements in this craft was something that many would aspire to achieve it in their career. Few months post recording this song massive crowd had turned up at Mumbai airport. Prime Minister Indira Gandhi was arriving in the city however the mob at the airport was actually waiting to receive the iconic pop singer with lilting voice Nazia Hassan. “Aap Jaisa Koi” film Qurbani music album sold over ten lakh copies then. 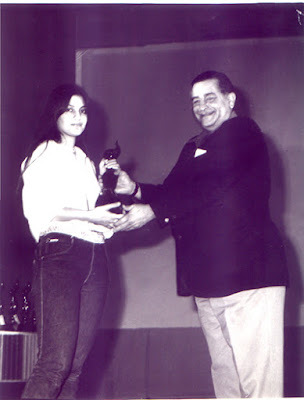 It was for the first time that a non-Indian and the youngest ever Nazia Hassan won the Filmfare Award for the Best Singer in the year 1981. The release of this movie Qurbani in June 1980 was indeed a grand affair. The Marathi Mandir theatre in Mumbai was house full for the next three months to full capacity. Not only the film but even the music was able to set the cash registers ringing at the Box Office. With passage of time and with the growing popularity of the song Nazia Hassan was seen performing it live on the center stage. Qurbani made the word “Disco” popular in India and people raved about disco then. The young singer from Pakistan Nazia Hassan captivated the hearts of millions across of the globe and became a popular star overnight. “Aap Jaisa Koi” changed everything then in 1980’s. The prime spot in Binaca Geetmala for the next 14 weeks had Nazia Hassan topping the charts with “Aap Jaisa Koi” leaving behind Lata Mangeshkar at number two position for the songs of her film Aasha. 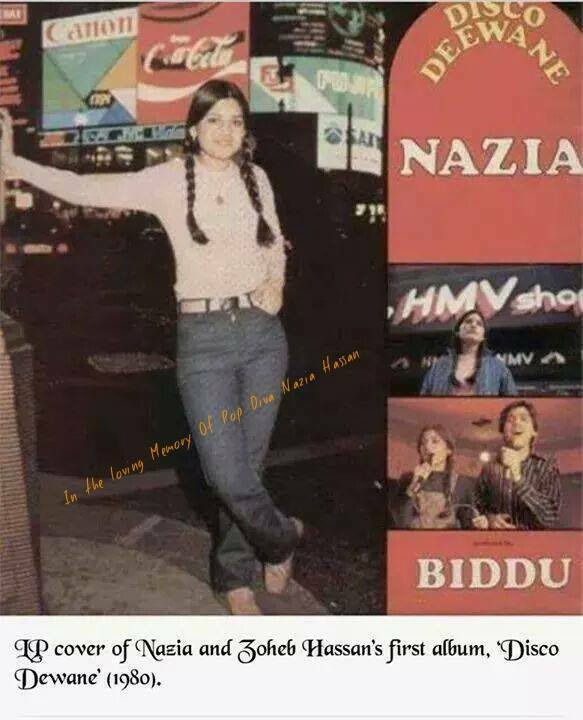 Post Qurbani in 1981 Nazia released her first music album titled “Disco Deewane”. Some of her hit numbers include Disco Deewane, Boom Boom, Ao Na and Lekin Mera Dil to name a few. It was only in the year 1992 post her album release Nazia left singing career. She completed her education in the UK, got a law degree. After an enormously successful career as a singer she later worked with the United Nations in the Security Council. She continued her social work even in New York and worked for children from UN platform. The Government of Pakistan has conferred upon Nazia Hassan the highest civilian award Pride of Performance. Nazia Hassan passed away at very young age at 35. She succumbed to lung cancer in London on 13 August 2000. She had been admitted to North London Hospice in London N12 three days earlier when her condition deteriorated. Nazia Hassan passed away early but still continues to remain forever young and beautiful in our minds. India Today nominated her as one of the 50 people who helped change the face of India while “Aap Jaisa Koi” remains India’s first international sound as far as music goes. Tribute to this legendary singer Nazia Hassan. Had Nazia been alive she would have been 50 years of age today.